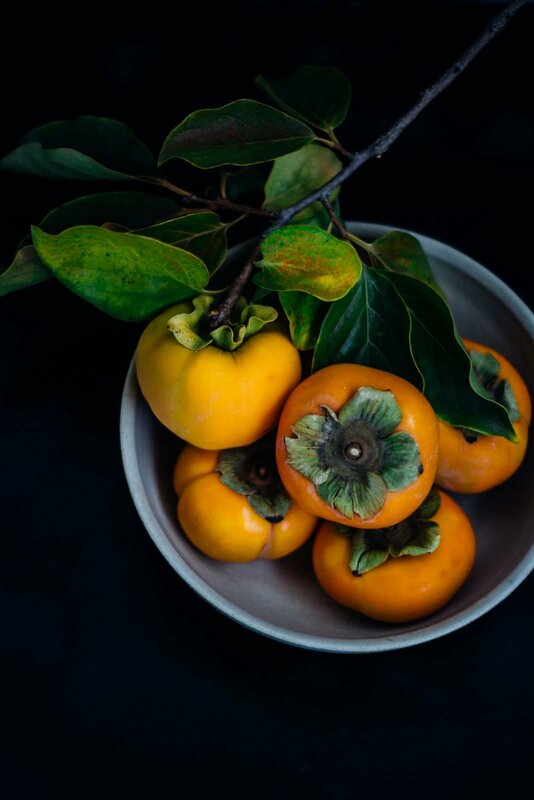 I love persimmons; I can’t get enough of them, growing up we had a tree in our backyard, and I would pick them and eat them while they were still warm from the sun. If you have never tried one, I highly recommend that you seek some out. When I redesigned the yard last year, my first request was for a persimmon tree. Well, I got my tree, but I only managed to grow one lone, solitary persimmon this season. But it was beautiful, and it made me dream of the best way to consume it. To be honest, I decided to eat it unadorned and just enjoy it for what it was, a great piece of fruit. I have posted a lot of recipes for persimmons here. I’ve roasted them, popped them into salads and enjoyed them for breakfast, but I’m always on the lookout for new ways to prepare them. One thing that my son really can’t eat when we go out is baked goods. It’s difficult to find pastries and cookies without butter and milk products, so I spend a lot of time developing dairy-free versions at home. 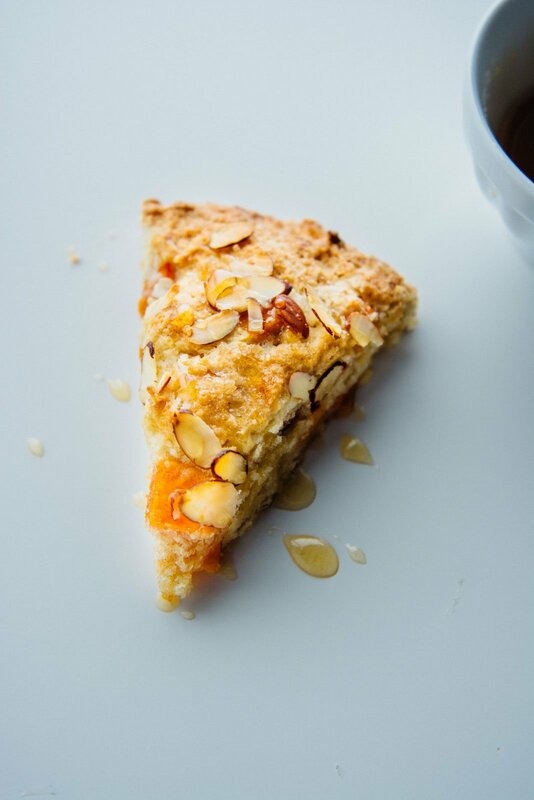 These almond persimmon scones turned out beautifully, crunchy on the outside from the turbinado sugar and wonderfully tender on the inside. 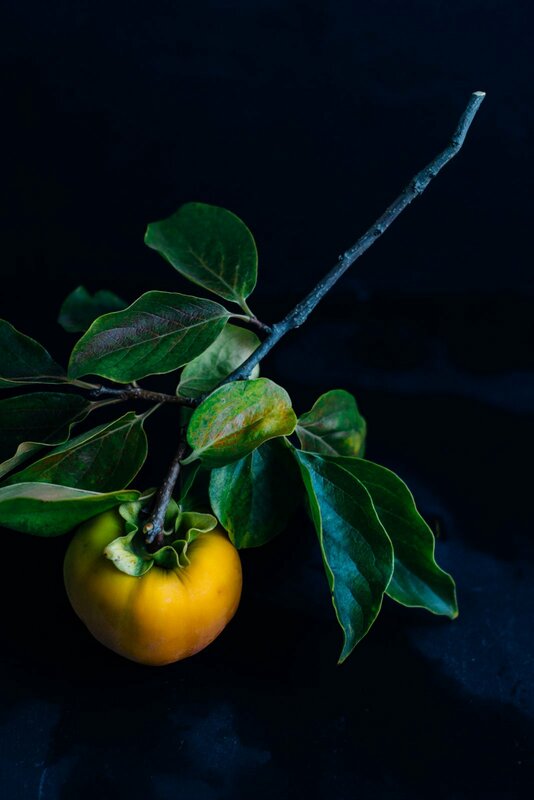 The addition of cardamom highlights the perfumed sweetness of the persimmons. I have to say that the more experience I have working without dairy, the easier it has become. You don’t have to sacrifice taste and texture by eliminating milk and butter. 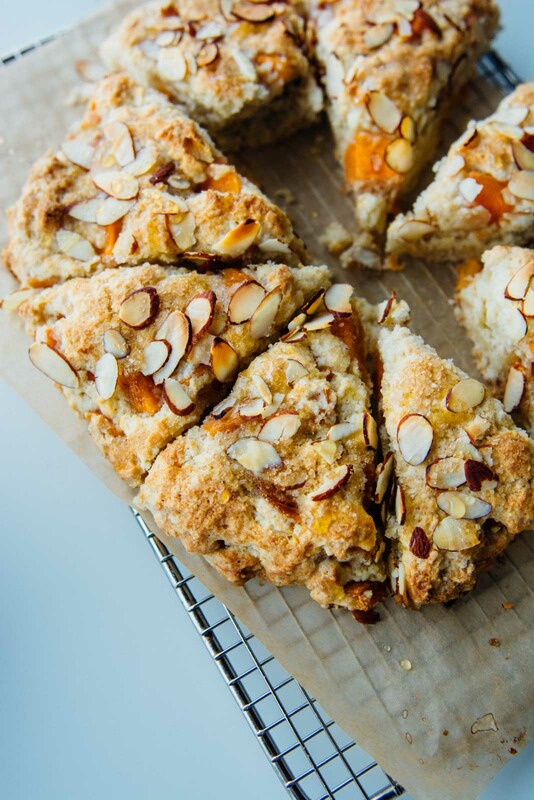 These almond persimmon scones are dairy-free, but you can easily substitute the coconut oil with butter if you don’t have an objection to dairy. 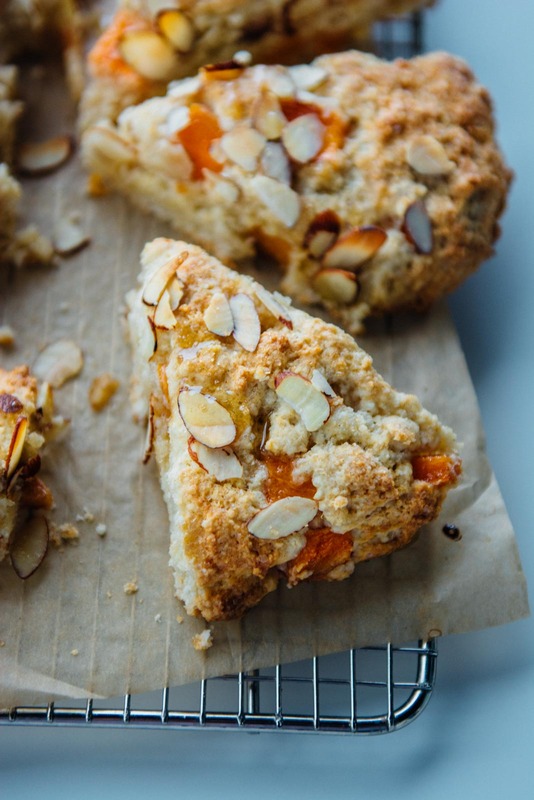 There are two varieties that you will find at the market so be sure to use Fuyu persimmons for these scones. They are short and squat and can be you can eat them while still firm like an apple or when they are ripe as a peach. If you’ve never tasted one, they remind me of honey and spices and pair well with cardamom and cinnamon. 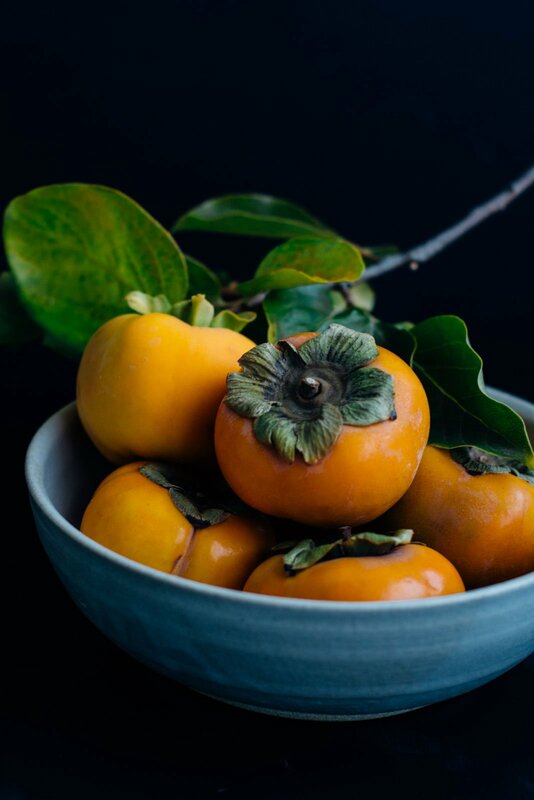 The other variety you will come across frequently, the Hachiya persimmon needs to ripen to the point of being mushy before it is ready to eat. Otherwise, the flesh is quite bitter and astringent, so they aren’t suitable to use for the scones. 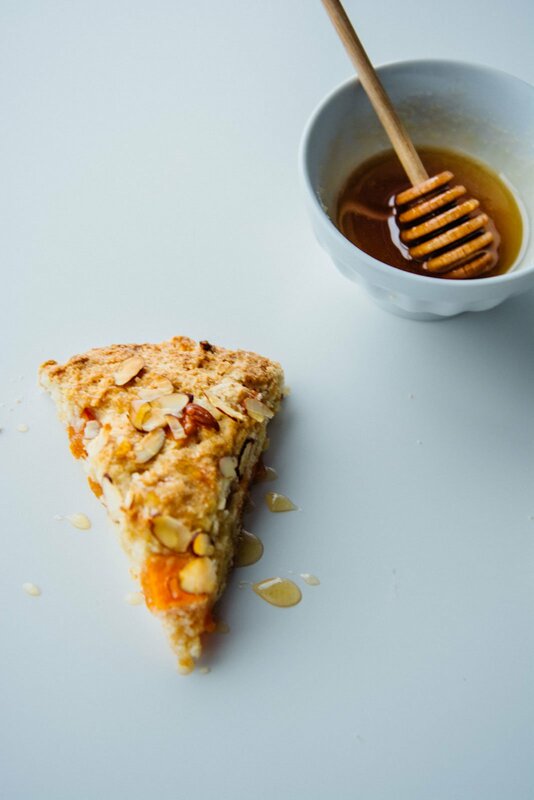 The scones aren’t overly sweet so to take them up a notch drizzle them with a bit of honey. 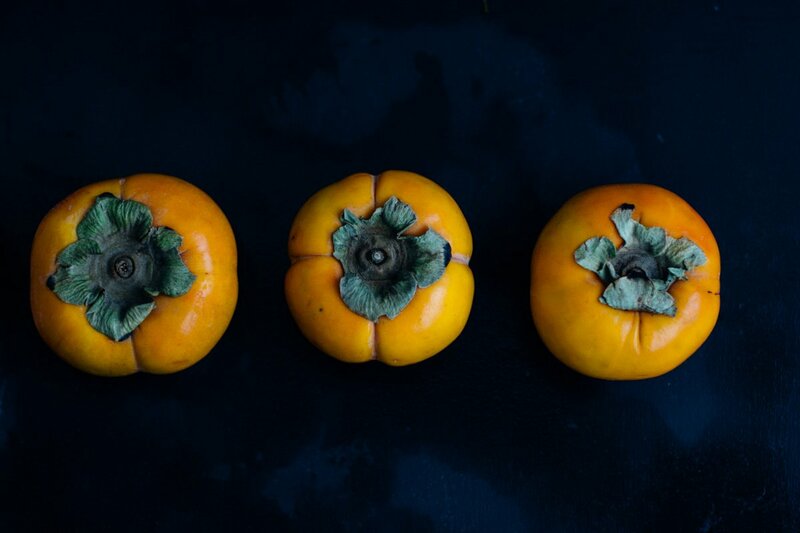 What are some of your favorite ways to enjoy persimmons? 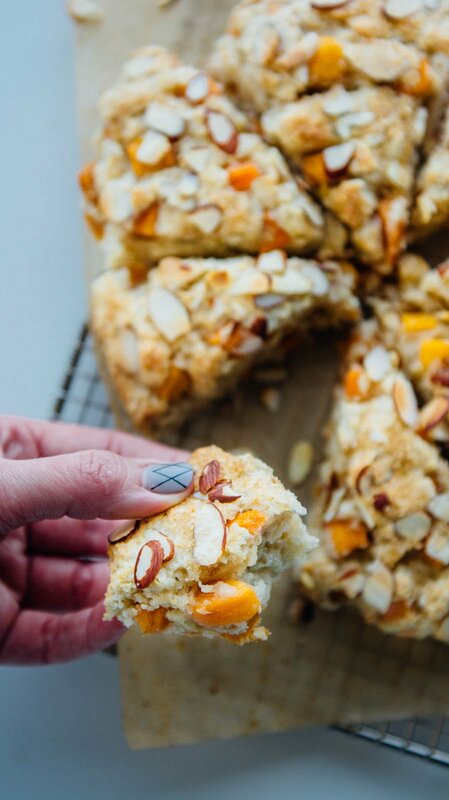 I’d love to hear how you use them in the kitchen and If you make these almond persimmon scones I’d love to hear what you think of them. Leave a comment, rate it, and don’t forget to tag a picture #scalingback on Instagram so I can see what you came up with! 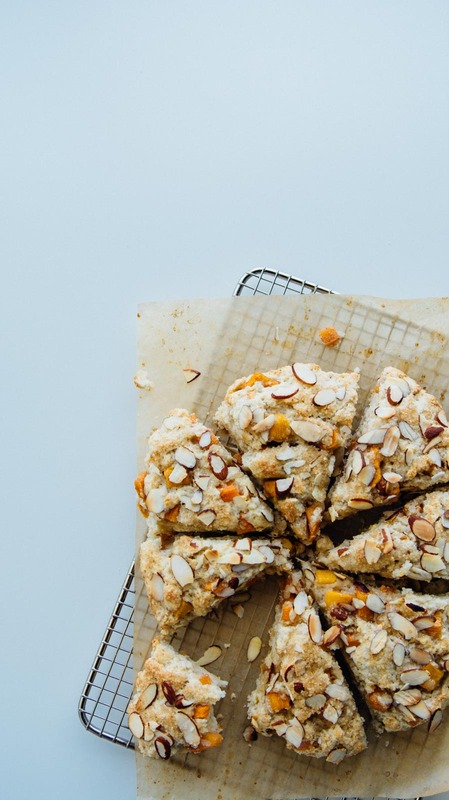 These dairy-free scones can be prepped and ready for the oven in 15 minutes or less. Lightly sweetened with fresh persimmons and cardamom they are crunchy on the outside and delightfully tender on the inside. Perfect! 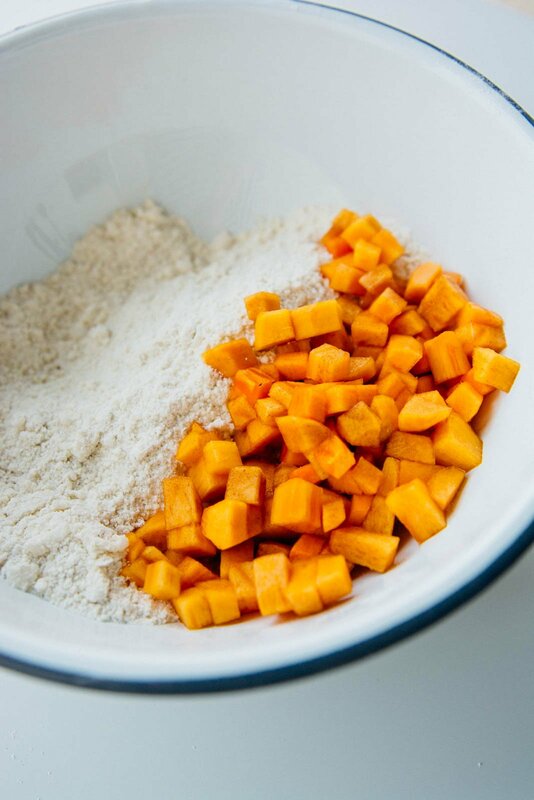 Add the persimmon, coconut milk, and almond extract and stir just to combine. The less you handle and knead the dough the more tender your scones will be. Dust the parchment with a little pastry flour and turn the dough out onto the baking sheet. Gently form the dough into a circle about 1-inch thick and flatten the top. Using a dough scraper or sharp knife cut the dough into eight equal triangles. If you want the sides to be crunchy separate the slices about 1-inch apart otherwise leave them touching. Sprinkle the almonds over the top, followed by the turbinado sugar. Bake the scones for 18-20 minutes until golden brown. 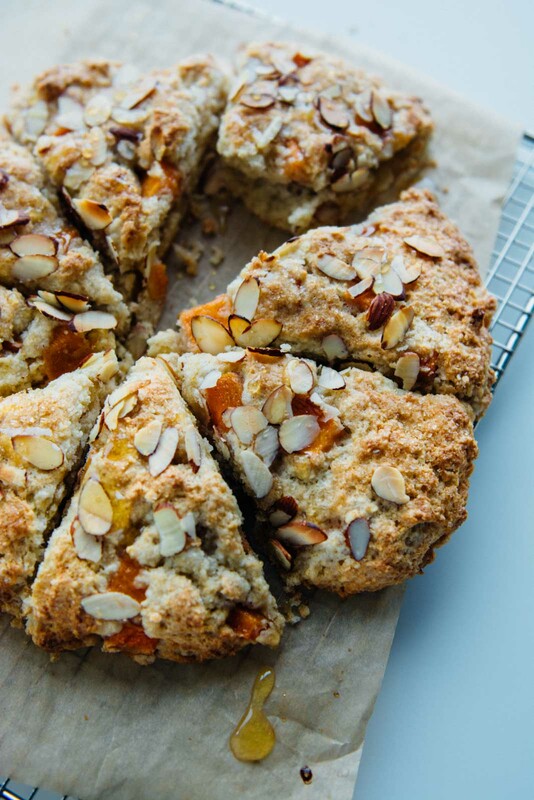 Remove the scones from the oven and immediately slide the parchment onto a cooling rack. The scones are best the first day but freeze well. To re-heat pop them in the microwave for 30 seconds. For even better texture thaw them overnight in the refrigerator and then reheat them in the oven at 350 for 7-8 minutes. I would like to make these for a friend who is allergic to coconut. She is not vegan so, would it be possible to make these with butter and milk? If so, how much of each? You can definitely replace the coconut milk and oil. Substitute 3 tablespoons of cold butter and 3/4 cups of heavy cream for the coconut products. I hope you like them if you give them a try. Thanks for checking out the recipe! which coconut milk, canned or refrigerated? I only have organic whole wheat flour, can I use that in place of whole wheat pastry flour? 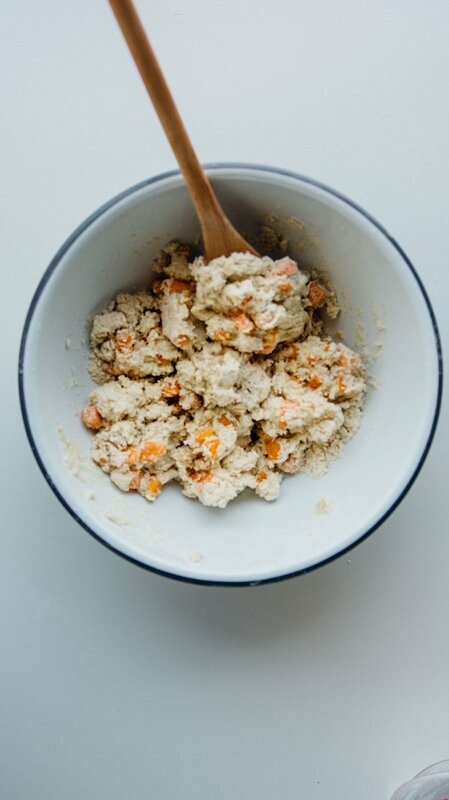 Since there is very little fat in the recipe you want to use full-fat canned coconut milk for the scones. Also, you can sub heavy cream and butter for the coconut milk if you regularly use dairy. Whole wheat flour will work but the color will be affected and you won’t have as delicate a crumb. I would suggest using equal parts whole wheat and white flour for the best results but if you don’t mind them being a little denser all whole wheat will work. These are like little bites of heaven. Absolutely delish. I’ll be making these again for sure. I planted a persimmon tree last year in the hopes of being able to make these on a weekly basis! Just made these and they are sooo good, even by themselves. They’re super easy to make and perfect for fall. I don’t really eat persimmons so this was a great way to take advantage of them being in season. I’m so glad you liked them! These are my favorite scones and so easy to make! Thanks for giving the recipe a try! 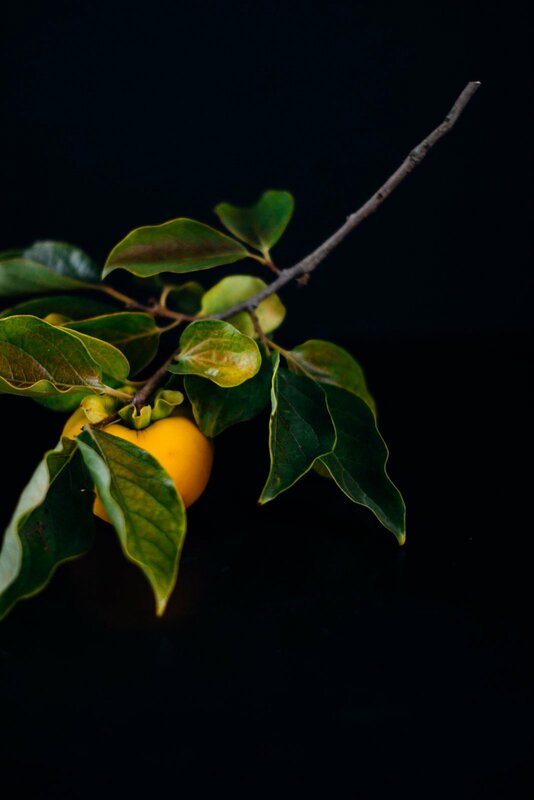 What are other fruits that I can use instead of persimmons? not sure if I can find them in January in my local grocery stores? You could use any winter fruit you like. Apples or pears would work great and if you want to use citrus Meyer lemon, blood orange or grapefruit would all work. I’d zest about a tablespoon of zest and add 2-3 tablespoons of juice. It will make the mixture wetter so you’ll probably need to add a touch more flour. Hope that gives you some ideas!